The current move towards turbocharging has seldom been met with more resistance than amongst the Porsche community, and while it is true that some aural character has been lost with the recently revised 718 Cayman, the new models offer a level of performance and dynamic ability that few competitors can match. 2018 sees no significant changes been made to the Cayman range. The interior of the Cayman mirrors that of the larger 911 range and even in standard form without the available full leather dash and door trim and multi-adjustable power seats the cabin feels solid and well built. There are more buttons and switches than you might expect in a modern touchscreen equipped vehicle but they are logically laid out and the major controls all fall easily to hand. The cargo space in the coupe is not overly generous but with the deep front storage area and the additional parcel shelf in the rear, there is more than enough space for shopping items and weekend bags. The mid-engined layout and superb suspension setup make the Cayman take corners as well as any thoroughbred sports car. Changes in direction and speed are almost telepathically linked to the driver’s inputs and the availability of carbon ceramic brakes, sport chrono, sport exhaust and adaptive suspension add even more clear air between the Cayman and its competitors. Fans of the outgoing 2.7-liter naturally aspirated engine may be interested to note that while the new 2.0-liter turbocharged unit has lost two-cylinders, power is up to 300 horsepower and torque is now a very healthy 280 lb-ft. A 6-speed manual transmission is standard while a 7-speed PDK dual clutch transmission is optional. Drive is sent to the rear wheels. Purists may hanker after the manual but the PDK masks any hints of turbo lag much better and provides serious acceleration off the line too. Such is this base turbocharged Cayman’s pace that opting for the more potent Cayman S is no longer the default option for performance enthusiasts. 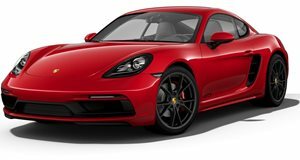 Standard items on the 718 Cayman include a stop/start system, 6-speaker audio system with 11GB internal storage, Bluetooth connectivity, park assist with reverse camera, cruise control, B-Xenon headlights, LED taillights and 18-inch alloy wheels. Despite its status as an entry level Porsche, this coupe is available with as many options as its much pricier stablemates. A full range of customizations from multiple paint colors, alloy wheels and many unique exterior detailing styles are available to choose from. Inside, other than the usual range of upgraded power heated seats and audio systems on offer you can also choose from leather, alcantara, wood, carbon fiber and aluminum interior trim finishes too. Be sensible however as if you tick the lot you will come dangerously close to doubling that seemingly attractive base price. Some notable available extras such as the sport exhaust system, Porsche Torque Vectoring (PTV), Porsche Active Suspension Management (PASM) and 18-way power adaptive sport seats should be on your shortlist though. A selection of available packages group certain of the above items together although you are free to pick and choose each individually too. Available safety items include lane change assist, adaptive cruise control and even a selection of Porsche designed baby seats. Shoppers should not let the slightly less characterful engine note and less linear power delivery dissuade them from considering the 718 Cayman, for they would be missing out on one of the world’s finest sports coupes. The turbo motor elevates performance levels beyond expectations while the incremental improvements to the chassis and interior make even this base Cayman a superb daily driver and track day weapon in one compact package.